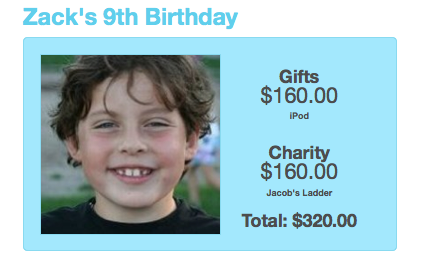 For Zack’s 9th laser tag birthday party, he got an iPod and Jacob’s Ladder got $160. | ECHOage - Get great gifts. Give to charity. ← For her birthday, Kira got a Best Buy gift card and Cancer Free Kids got $205! For Zack’s 9th laser tag birthday party, he got an iPod and Jacob’s Ladder got $160. 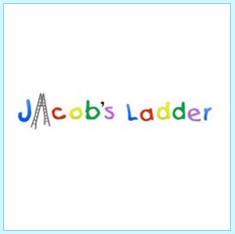 Zack was passionate about helping Jacob’s Ladder as he has a personal connection to Jacob and wanted to do something to help. Not every nine year old chooses to fund research, awareness, education and treatment for neurodegenerative illnesses. But this nine year old chose to celebrate his birthday with his friends and make a difference by supporting this tremendous charity’s mission. We are certainly inspired by Zack, and of course Jacob who has touched the lives of countless people both young – and not so young – with his loving nature and enormous smile. Getting an iPod was certainly icing on the cake for Zack. Nothing like the gift of music and video games to keep a nine year old moving and shaking. Zack, we thank you for making your Laser Tag birthday party an event that will have lasting impact for Jacob’s Ladder and all of your friends who helped make this birthday party extra special.